A significant proportion of my clientele at the Musicians’ Clinics of Canada are for “second opinions”. Recently I had a referral where a trombone player was fit with ER-15 musicians’ earplugs but was complaining of the occlusion effect. The ear impressions were remade with a much longer earmold bore but the occlusion complaints remained. Indeed when I saw this man, the earmolds were very long and I doubted that anyone could make them longer without going into the middle ear! For readers of this blog, people know that I am half audiologist, half linguist, and half musician…. Well, maybe 1/3 musician…. So I am always looking at ways to combine linguistics and audiology (and music). 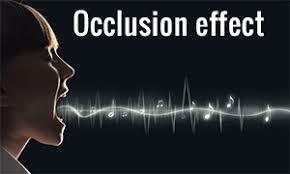 The occlusion effect is a measureable increase in low frequency sound pressure that is created by plugging up or occluding the outer ear canal. Typically this low frequency sound is allowed to exit the ear canal to the environment and we are not aware of this low frequency build up- its only when we block the exit that the occlusion effect is noticed. Because of the laws of physics low frequency sounds will always take the path of least resistance and in a normal unoccluded ear canal this means that low frequency sounds would tend to go out of the ear canal to the environment rather than continue on through the middle ear to the cochlea and to lands upstream. But with an ear canal occlusion, this low frequency sound is forced through the middle ear and onwards. For any language of the world, the only sounds that have significant low frequency sound energy are the high vowels [i] as in ‘beat’ and [u] as in ‘boot’ and every single language of the world have both of these two vowels in some form- either as a diphthong as in English ([iy] and [uw]) or just as a pure vowel as in French ([i] and [u]). This is considered a “linguistic universal” (and of course every language also has the low back vowel [a] or some closely related cousin. 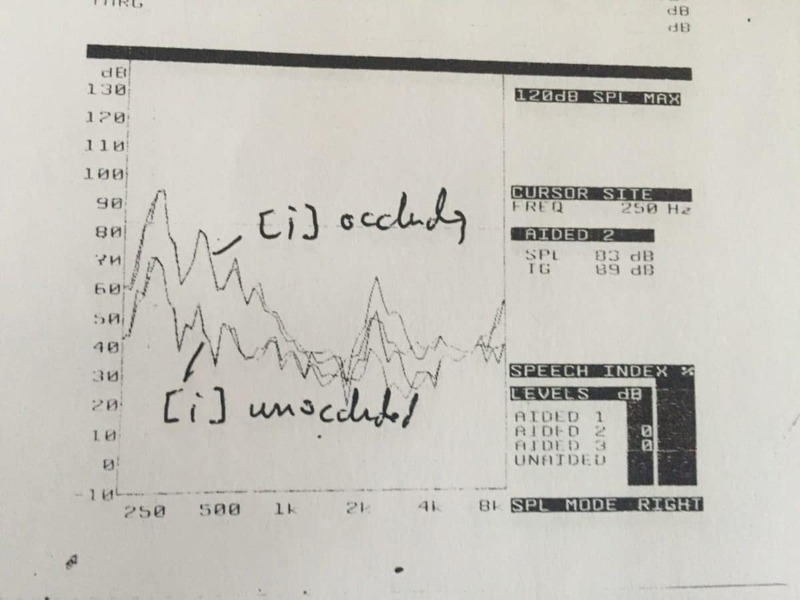 It is these high vowels ([i] and [u]) that create the problem with the occlusion effect for speech, and musical sounds that have their fundamentals in this same frequency region that create the problem for music. Clinically, whenever I perform a hearing aid evaluation and hearing aid fitting, I ask my clients to say the pair of vowels [i] and [a]. In the normal unocccluded state, these two vowels have similar sound levels- they are equally loud. If however, the high vowel [i] is perceived as louder than the [a], then this is an occlusion effect that needs to be resolved before I let the hearing aid wearer out of my office… or else I will be seeing them in several days’ time for a hearing aid “return for credit”. If there is an occlusion effect, whether it’s from a hearing aid fitting or hearing protection or even in-ear monitors, the two clinical strategies are to either remake the earmold with a longer bore or to incorporate a vent to allow the low frequency sound energy to be bled off. In the case of hearing aids, unless the fitting is for someone with a very significant hearing loss in the low and mid frequency region, we can successfully incorporate a vent into the earmold coupling. 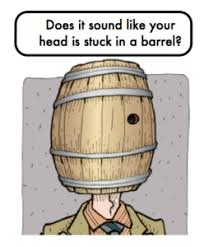 With hearing protection however, we would compromise some of the lower frequency attenuation. So, remaking the earmold with a very long earmold bore is quite reasonable if there is significant occlusion reported with a musicians’ earplug. But sometimes this doesn’t work well and venting is required. The short answer here is that I ended up drilling a 1.4 mm wide vent and the trombonist was quite happy, despite the trade-off that needed to be made between wear-ability and low frequency sound attenuation. This is the measured occlusion effect for this trombonist while wearing the ER15 long bore earplugs. The technque to accomplish this will be discussed in part 2…. and this took only about 15 seconds to obtain! In part 2 of this blog series I will share some real ear measurement results and a clinically quick technique to show how to measure the occlusion effect (and in this man’s case, it was over 20 dB at 250 Hz even with these long bore remade musicians’ earplugs) and just as importantly, how to verify that the occlusion effect has been successfully resolved. Previous Post Speech is not a broadband signal… but music is. Don’t give up anything. Hearing aids not only provide amplification where needed but just as importantly ensures that the sound that reaches your ear never exceeds a damaging or irritating level. Wear hearing protection when mowing the lawn and other nosy activities but don’t give up your music. I’m a trumpet player about to be fitted with hearing aids and contemplating giving up the various bands I perform in to avoid further hearing loss.